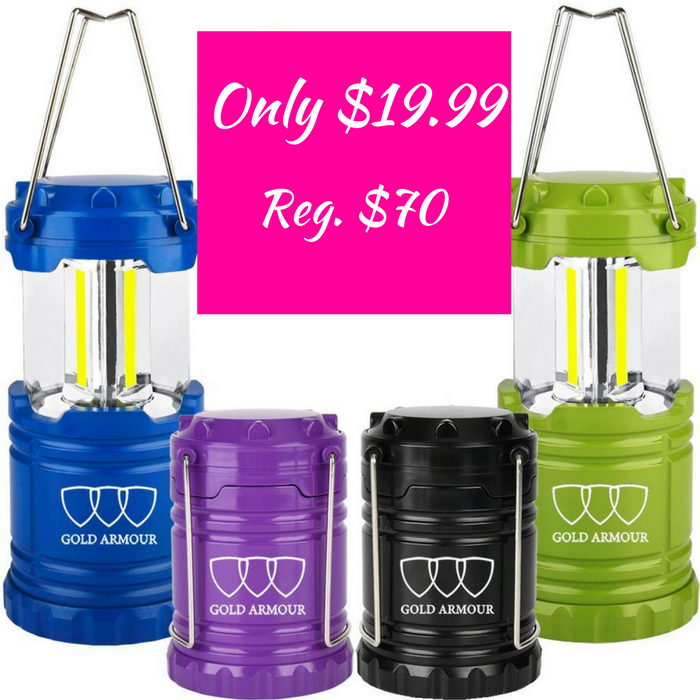 LED Lantern Lights 4-Pack Just $19.99! Down From $70! You are here: Home / Great Deals / Amazon Deals / LED Lantern Lights 4-Pack Just $19.99! Down From $70! Score this LED Lantern Lights 4-Pack at Amazon for just $19.99 down from $69.99 PLUS FREE shipping with Amazon Prime or for orders $25 or more! The most convenient backpacking & hiking lights that will make you the saving grace! Super bright 30 individual low powered LED bulbs, designed for a longer lifespan with 360 degree 135 lumens. Great for families, campers, backpackers, hikers, or even as a book light, work light, reading light, halloween light, or as an emergency light. It is water-resistant to withstand weather conditions and collapsing brightness control. Awesome! DEPENDABLE BUILD – Each of our premium LED lanterns Camping Lanterns are hand-built with military-grade, water-resistant plastic – making them extra durable wherever you may be. The lantern is built for both the indoors & outdoors. ADVANCED COLLAPSIBLE DESIGN – Superior design and construction allows our lantern to be SUPER lightweight and compact. Our lantern is EASILY collapsible with a simple push.